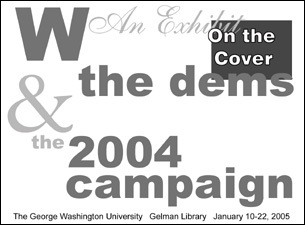 DEMOCRACY IN ACTION's exhibit "On the Cover: W, The Dems & the 2004 Campaign" was held at the George Washington University's Gelman Library from Monday, January 10, 2005 through Sunday, January 23, 2005 (one extra day added). This special retrospective exhibit is presented to commemorate the 55th Presidential Inaugural. As President Bush begins a new term it is appropriate to review the past four years. The exhibit looks at Bush in his first term, at the race for the Democratic nomination, and at the general election campaign through the medium of the magazine cover. The purpose of the exhibit is to show how these individuals and events have been portrayed and to encourage viewers think about these depictions. The types of images used, the choice of words, and the interaction of the words and the image on a magazine cover combine to create an specific impression which in turn contributes to our broader view. Starting in 2001 DEMOCRACY IN ACTION has gathered Bush and 2004 campaign related covers on national magazines, including major (Time, Newsweek and US News &World Report), midsize (The Economist), and smaller (World) newsmagazines, opinion magazines (The Nation, New Republic, National Review, Weekly Standard, American Prospect and Washington Monthly), and more specialized political magazines (National Journal and CQ Weekly). In addition, relevant covers were obtained from a number of magazines that do not have a consistent political focus as well as from some overseas magazines. All told there are over 400 covers. These include favorable, unfavorable, and neutral portrayals, photos and illustrations, good art and bad art, essentially any covers we could find with Bush and with the campaign. The Bush covers will be arranged in chronological blocks by year; the campaign covers by candidate and theme. Bush's critics have had their say, for example, in The New Republic's May 21, 2001 issue "He's Lying" or its June 2, 2003 issue "He's Still Lying." The American Prospect's May 2003 issue even labeled Bush "The Most Dangerous President Ever." One expects such views from opinion magazines, but newsmagazines have also weighed in with some critical portrayals (Time's July 21, 2003 "Untruth & Consequences" or its Oct. 6, 2003 "Mission NOT Accomplished" or The Economist's April 3, 2004 "Better ways to attack Bush"). In terms of the campaign for the Democratic nomination, Governor Howard Dean dominated covers in the second half of 2003 and January 2004. During the primary period when the race for the nomination(s) is ongoing, making the cover of one of the big weeklies can be a big plus for a candidate as he or she strives to achieve credibility. Dean was seen as such a frontrunner that The Economist even paired him opposite Bush on its Jan. 3, 2004 issue "America's angry election year." From February 2004 onwards, as Senator John Kerry swept contest after contest, he achieved a slew of covers, mostly positive. Newsweek's Feb. 23, 2004 cover "Their Wars" appears to be the first cover that matched up Kerry, then the likely Democratic nominee, and Bush. There were also large number of covers around the time of Kerry's selection of Senator John Edwards as his running mate and several weeks later around the Democratic National Convention. 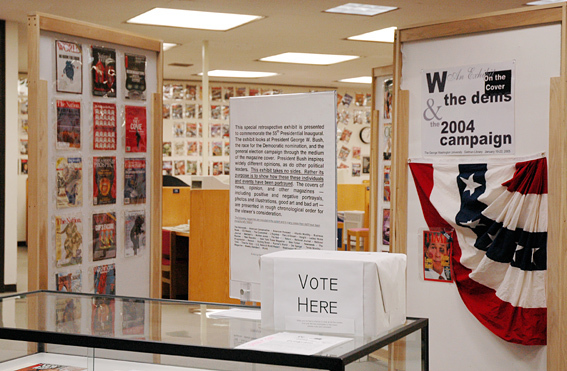 In addition to the candidates, magazines highlighted various campaign-related themes during the election cycle. The media itself came under attention at several points (for example Newsweek's Dec. 29, 2003 issue featuring the Daily Show's Jon Stewart, several covers highlighting CBS anchor Dan Rather's memo problem, and a New York Times Magazine look at bloggers). The Washington Post Magazine put a non-voter on its cover. The integrity of the voting process also garnered a bit of notice. In general, a magazine cover combines an illustration or a photograph and a few carefully chosen words. It is designed to catch your eye, pique your curiosity and hopefully get you to stop, pick up a copy of the magazine and buy it. By the time a weekly magazine hits the newsstands or arrives in the mail, a whole week's worth of events has passed by. Accordingly, magazines must seek to provide something different than the daily paper, often by highlighting broader themes and currents. Even if the cover doesn't cause us to stop and buy a copy of the magazine, we may view it in the newsstand window as we rush by in the morning to catch the Metro and again in the evening as we head for home. Copies of magazines may grace our living room tables or office reception areas for weeks or even months, thereby influencing our impressions of the individuals and events depicted. Why did the editors chose to use an illustration or a photo for a particular cover? Do covers of opinion magazines differ from the covers of more objective news magazines? Is the cover intriguing, creative, or thought provoking or is more formulaic and unimaginative? Is the cover fair or unfair...on point or off the mark? 1. The two other major newsweeklies took a different approach for the Sept. 24, 2001 issues. Newsweek ran a photo of firemen raising the flag amid rubble and the caption "God Bless America." USN&WR ran a photo of WTC wreckage and the caption "Under Siege." 2. The Charles Ommanney photo on the cover of the Sept. 6, 2004 issue of Newsweek generated varied responses from readers. In the Sept. 20 letters, Bruce Wallin of Pacific Palisades, California wrote, "Your Sept. 6 cover was perfect. You somehow managed to capture in one photograph, the fearless leader Bush's supporters adore and the cocky dunce his detractors revile." However Robert Shive of St. Charles, Missouri had a different opinion. "It's hard to imagine a more unflattering picture than your cover photo of George W. Bush," he wrote. The Advocate - American Conservative - American Prospect - Atlantic Monthly - Business Week - CQ Weekly - The Economist - L’Express - Field & Stream - Insight - Ladies’ Home Journal - Maclean’s - Mother Jones - The Nation - Nature - National Journal - National Review - New Republic - New York - New York Times Magazine - New Yorker - Newsweek - The Progressive - Reason - Rolling Stone - Runner’s World - Der Spiegel - Texas Monthly - Time - Time for Kids - U.S. News & World Report - Washington Monthly - Washington Post Magazine - Weekly Standard - World. Eric M. Appleman (GW, Poli. Comm. '93) is solely responsible for the presentation of this exhibit. He organized a similar exhibit "Cover-ing the Campaign," also at the George Washington University, following the 2000 campaign. He runs the DEMOCRACY IN ACTION P2004 website (address above). DEMOCRACY IN ACTION P2004 and the predecessor P2000 are hosted on the George Washington University server but not formally affiliated with GW; the aim is to provide a framework for citizens to understand presidential campaigns. Appleman gathered many of the magazine covers in personal visits to the various publishers' DC offices during the course of the past four years. Without their assistance this project would not have been possible. "The Exhibit, visually appealing and thorough in its coverage, was well received by the GW community."